#s 27 and #28. Can you believe it? 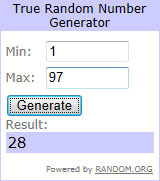 What are the odds that the random number generator would select consectutive numbers? My best was my last one, a baby quilt. It was just a panel with pretty borders added, but it turned out so stinkin cute! I outline quilted the little animal scenes in the panel and did daisies and loops in the borders. Hope the mother liked it as much as I did! The best handmade gift I ever gave was a hand painted Christmas village that I painted for my Mom when I was in high school. She had no idea I was painting it and I managed to keep the whole thing a secret from her. It was so fun to see her surprise when she opened it on Christmas! Contact me so you can claim your flowers and patterns! I so enjoyed reading all of your messages and stories. For me, this was my favorite giveaway ever. Thanks to everyone who commented. If you commented early on or didn't have a chance to read through the messages at the time, take a second and peruse them. They'll warm your heart! Conagratulations to the winners and hoping you have much enjoyment using your prizes. Congratulations to the lucky winners....enjoy! Congratulations to the winners! Show us what you create.